Economic logic and pragmatism are two key words which describe the state of bilateral ties between India and China as the trade between the two most populous countries rose by 36.5 per cent in the first six months of this year. Some leaders of the Bangladesh Nationalist Party and other parties are set to defect to former Prime Minister Sheikh Hasina’s Awami League (AL) in what could strengthen the latter’s poll prospects considerably. 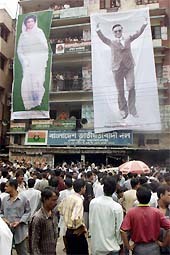 Portraits of former President Ziaur Rahman (right), founder of the BNP, and former Prime Minister Begum Khaleda Zia (left), hang as supporters of the party gather in Dhaka on Tuesday to know the candidates to be nominated for contesting the poll. American Mark Lichtle parachutes down from the world's tallest buildings, the Petronas Twin Towers, during a practice ahead of the Malaysia International Extreme Skydiving Championship in Kuala Lumpur on Tuesday. Fifty-one base jumpers from 16 countries will be jumping 452 metres (1,483 feet) during the international tournament being held from Wednesday through Sunday in the Malaysian capital. The process of general election in Bangladesh will begin tomorrow, with the filing of nomination papers by the prospective candidates for 300 parliament seats. The number of contestants will be finally known after the withdrawal of nomination papers on September 6. The political parties and candidates will then get 31 days for campaigning from the day of filing nomination. A Palestinian policeman died of his wounds early today after being shot by Israeli troops who had occupied “dominant positions” in the autonomous Palestinian town of Beit Jala, Palestinian hospital sources said. A slain Palestinian security officer is carried by his comrades on the way to his funeral in the West Bank city of Hebron on Tuesday. In fresh violence on Tuesday, the officer was shot dead in a gun battle with Israeli soldiers in Kharsa, a Palestinian-controlled village near Hebron. Ranbir Singh Guri, Chairman of the British Asian Conservative Link, left, stands next to Opposition Conservative Party leadership contender Iain Duncan Smith, right, in London on Monday. Duncan Smith and another leadership contender Kenneth Clarke, were addressing the Tory-supporting Asian business group, at a banqueting hall. Duncan Smith wears a garment presented to him by the BACL. Bush cleared PFLP chief’s killing? Egypt’s government press today accused US President George W. Bush of giving Israel the “green light” to assassinate Palestinian militant leader Abu Ali Mustafa a day earlier in the West Bank. UN Secretary-General Kofi Annan urged the USA to take part in a racism conference opening in South Africa this week. A four-wheel drive car smashed through a petrol stall into an outdoor market in central Cambodia, killing 13 persons, many of them burnt to death, and injuring 37, officials said today. Sri Lanka’s two main parties extended coalition talks today in a last-ditch bid to end a major political crisis that has led to the suspension of Parliament and brought demonstrators on to the streets. Election officials today said about a third of Fijians had voted in the country’s polls aimed at restoring democracy as observers said an alliance including former coup leader George Speight was doing better than expected. Peru’s Congress has unanimously voted to charge former President Alberto Fujimori with homicide, inflicting serious injury and abduction in a new bid to press Japan to extradite the disgraced leader. Around 400 refugees, including pregnant women, children and sick people, on a ferry stranded in the Indian Ocean (R) are seen before they were rescued on board the Norwegian cargo ship Tampa, some 120 km off the remote Christmas Islands on Monday. Norway's Foreign Minister urged Australia to allow the asylum-seekers crammed onto a Norwegian cargo vessel into an Australian port on Tuesday, saying the situation was critical for those aboard. Indonesian Foreign Minister Hassan Wirajuda speaks to reporters in Jakarta on Tuesday after returning from an Asian trip. Wirajuda said on Tuesday the country would not accept the more than 400 illegal immigrants stranded on a cargo boat in the Indian Ocean, reversing the government's earlier decision. The economic ties and the process of normalisation, which began in 1988 and brought back to rails after a break of about a year following the Pokhran nuclear tests, are going to be put in fast forward mode when Chinese Prime Minister Zhu Rongji pays an official visit to India in the next three months. The process has already been set in motion as External Affairs Minister Jaswant Singh is scheduled to arrive in China in October this year. The Chinese Prime Minister’s visit to New Delhi is in a sense “unprecedented” as the number two of the Chinese leadership Li Peng was on a nine-day trip to India earlier this year. Normally two high-level visits are not a usual event in the diplomatic bilateral calander. The surge and consolidation of bilateral ties is the result of a combination of domestic as well as international factors. Observers here say that there is growing realisation among the decision makers in the two capitals that there is a strong factor of complimentarity which if judiciously put to use can become a dynamo for growth of economic and other ties between the two countries. Yes, the boundary question is one of the most difficult issues to resolve, they say pointing out that the bilateral ties can be divided into problematic and non-problematic areas and can be put on two seperate tracks. That is what precisely the leadership of the two countries have decided to do, a senior official of the Ministry of External Affairs told a group of mediapersons before they left on a 14-day trip to China. The statement is confirmed here by the Chinese and the Indian Embassy officials. A concrete evidence is available in bilateral trade figures. While the bilateral trade touched a figure of $ 2.91 billion last year - a rise of 46.6 per cent - the figures of the first six months also show that balance of trade has also started narrowing down. The trade is also diversifying as China is moving into newer areas. In 1995, the bilateral trade was only $ 1.1 billion and it was continuously rising till 1998 when it increased only by 5 per cent and in 1999 the growth was dismally poor at only 3.6 per cent. But once the political leadership of the two countries decided to close the Pokhran chapter, trade grew by 46.6 per cent with Indian exports rising by 63.9 per cent. With China maintaining a high growth rate of over 7 per cent, the opportunities for the growth of bilateral trade exist, officials here point out, adding that the soil is ready but it only needs to be politically nurtured. Former Prime Minister Begum Khaleda Zia, chief of the Bangladesh Nationalist Party (BNP), smiles at members of the Overseas Correspondents Association in Dhaka on Tuesday. According to reports, these leaders from the BNP and Jatiya Party (JP) are reportedly lining up to join the Awami League ahead of the last day of filing of nominations on Wednesday. Mizanur Rahman Chowdhury, head of one of the three factions of the JP founded by former President H.M. Ershad, has returned to the Awami League, the reports said. Chowdhury reportedly joined the party after Hasina’s arrival here Monday from Makkah. Hasina is to launch her party’s election campaign after offering prayers at the shrines of saints Hazrat Shahjalal and Hazrat Shah Paran in Sylhet. Chowdhury’s party secretary, Anwar Hossain Manju, is also likely to join the Awami League. Chowdhury, who had steered the Awami League before Bangladesh’s independence in 1971 while Hasina’s father and the country’s founder Sheikh Mujibur Rahman was in jail, left it following a leadership feud with Malek Ukil, who had become Awami League president. He was also Prime Minister while Ershad was President. He also led the Jatiya Party while Ershad was in jail during Khaleda Zia’s tenure as premier. In another development, former Speaker Sheikh Razzak Ali (BNP) has threatened to quit the party if he does not get the ticket to contest the October 1 elections. Oli Ahmed, a former Communications Minister, is also giving the BNP headaches. He was elected twice from two seats in Chittagong but the Jamaat is demanding one of the two seats. But reports suggest several BNP leaders are in the line to join the Awami League. They include former Foreign Minister Kamal Hossain, now head of the Gano Forum. Meanwhile, Awami League (AL) chief Sheikh Hasina, who stepped down as Prime Minister last month, will be contesting the elections from five constituencies. AL’s Abdur Razzak announced the list of party candidates for 293 of the 300-seat Parliament ahead of the August 29 deadline for submission of names to the Election Commission. Apart from Hasina, the list has 10 other women candidates. Among them are former Forest and Environment Minister Syeda Sajeda Chowdhury, former Agriculture Minister Motia Chowdhury and a former minister Zinnatunnesa Talukder. Meanwhile, the pre-poll polarisation in the political circle generated surprises by the major political parties- the Awami League(AL), the Bangladesh Nationalist Party (BNP) and the Jatiya Party (JP) faction led by Mr H.M. Ershad. More surprises are speculated by local dailies. Daily Jugantar, Janakantha and the Bangladesh Observer in their reports said today that Mr Zafar Imam, a senior leader of the JP (Ershad) and Major-Gen Majedul Huq, (retd) a central leader of the BNP, Mr Mahbubul Alam, former whip of BNP, Ms Tasmima Hussain, wife of a former minister and secretary-general of the JP (Manju), herself a former JP Legislator are likely to join the AL any day. No denial has sofar come from any party. On the other hand Mr Dhirendra Nath Saha, a former Al Legislator from southern Narail district, and industrialist Abul Hashem joined the BNP yesterday. The AL went ahead of its arch rival, the BNP, in announcing yesterday the list of 193 of 300 candidates. The name of Mr Chowdhury and Mr Rabby have been added to the list taking it to 195. The 11-party alliance, a combine of smaller left parties, the JP (Manju) and the JP (Ershad) announced partial list of candidates yesterday. Meanwhile, the Al has kept five seats reserved to accommodate candidates like Mr Zafar Imam, who will be contesting against Ms Khaleda Zia in her constituency and Mr Mahbubul Alam who will contest against a former BNP legislator, Ms Tasmima Hussain. The AL also faced revolts in some districts over the issue of nomination of candidates. Two more Palestinians, one of them a journalist, were slightly wounded, the sources said. At the same time the Israeli forces made an incursion, with tanks and bulldozers, into the Gaza Strip, destroying houses and leaving four Palestinians injured there, Palestinian security sources said. The dead man was identified as Mohammad Samur, 23. He died about an hour after being hit in the chest during clashes. His death brings to 748 the number of people killed since the Palestinian intifada, or uprising, erupted last September, including 572 Palestinians and 154 Israelis. Beit Jala is on the outskirts of the West Bank town of Bethlehem, and the Israeli army said it moved in, shortly after midnight, following gunfire there. “Our forces have occupied dominant positions in Beit Jala and will maintain a presence there to prevent further firing,” an army spokesman said in a statement. “Our forces will operate for a limited time to achieve their objectives,” the statement said. “This is a new stage in the gradual Israeli escalation carried out by Israeli Prime Minister Ariel Sharon,” Palestinian Cabinet Minister Yasser Abed Rabbo told Reuters. “This is the phase of reoccupation, therefore on the ground he has practically paved the way for war. We have every right in the world to resist occupation,” Rabbo said. JERUSALEM: Israel will not attack top Palestinian officials or members of Yasser Arafat’s Cabinet in future raids, an Israeli official said in today’s edition of the Haaretz newspaper. 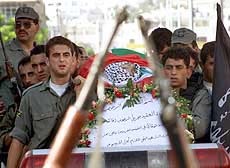 “The assassination of the Popular Front for the Liberation of Palestine (PFLP) leader came just two days after Bush said Israel would not negotiate under so-called ‘terrorist’ threats,” the government paper Al-Akhbar wrote. “I hope the U.S.A. will participate and that they will come and sit with other governments to move the process forward,” Annan told a news conference during a visit to Austria. The U.S. State Department had said earlier that US Secretary of State Colin Powell would not attend the UN World Conference Against Racism because of “offensive” language against Israel in some texts, adding that it might boycott the conference altogether. Local Cambodian newspaper Rasmei Kampuchea (Light of Cambodia) branded the crash the country’s worst in decades. The vehicle, belonging to the government’s National Election Committee, hit a stall selling bottles of petrol in Kompong Thom province, 130 km north of Phnom Penh, on Sunday afternoon. “Up to now 13 persons have died and over 20 are in serious condition in hospital. Seventeen others were slightly injured,’’ Treng Savuth, chief of the province’s election committee, told Reuters on telephone today. Delegations from the minority ruling coalition and the main opposition United National Party (UNP) agreed to meet at 9 p.m. (1500 GMT) to try hammer out a deal before Parliament meets on September 7. “The parties have agreed to meet later and that looks like it will be the final chance,” said a source close to the government delegation, after what was billed as the final meeting between the two sides ended without agreement. Meanwhile, five Sri Lankan soldiers were killed when Tamil Tigers blew up an army tractor at Kilachuri, 15 km north of Vavuniya, this morning. Around 36 per cent of voters had cast their ballots in the first two days of seven days’ polling in Fiji’s general elections, elections supervisor Walter Rigomoto told reporters.